Low maintenance, reversible, long-lasting, cost-effective, progestogen only, can assist managing periods. Doctor required to insert / remove, may cause side effects, small risk of perforation and expulsion. How does the Hormonal IUD work? 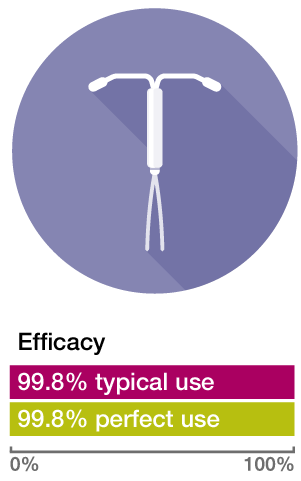 The Hormonal IUD releases small quantities of progestogen, localised to your reproductive system. This thickens the mucous of your cervix, making it difficult for sperm to move. It also thins the lining of your uterus. For people who experience heavy menstrual bleeding, the hormonal intrauterine device has been associated with a higher quality of life. It’s also been associated with a reduced risk of ovarian and endometrial cancer. Tip: Ensure that insertion and removal are as effective and painless as possible by going to a professional proceduralist for insertion of the Hormonal IUD. How do I use the Hormonal IUD? Step 1. Because the Hormonal IUD is a method of LARC, it doesn’t require you to do anything except show up for the insertion and removal. Step 2. Once it’s inserted, you can forget about it for up to 5 years, before you need to replace it. Step 3. If you change your mind at any point in those 5 years, you simply make an appointment to have it removed. Simple, right?